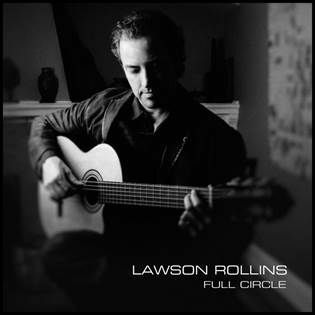 San Francisco, Calif. (16 July 2013): Prodigious guitarist Lawson Rollins’ “Full Circle,” a riveting 12-song aural adventure crammed with culture and masterful musicianship that was released today by Infinita Records, is like traversing the world without the hassles of modern travel. Rollins’ fourth album, which he produced with multi-platinum producer Dominic Camardella (Ottmar Liebert, Flora Purim, 3rd Force), explores the borderless expanse of captivating melodies and fascinating global rhythms while discovering multicultural sounds that play like the ideal soundtrack for an intriguing National Geographic expedition. The first radio single, “Momentum,” paced by a driving groove, frenetic fretwork and hints of Japanese folk music, has consistently been one of the most added tracks on the Billboard BDS for more than a month. Rollins composed “Full Circle,” which mirrors his own artistic journey. On earlier releases, he crisscrossed the world on a quest to amass interesting styles to incorporate into his sonic collages that mine world music, jazz, rock, classical, folk and reggae. Along the way, he unearthed a fondness for Latin, Middle Eastern, African and Japanese sounds and instrumentation. Rollins recorded with the finest native musicians to maintain authenticity. On “Full Circle,” he decided to travel with a smaller suitcase thus packed fewer layers into the still lush tracks, which places the focus on his ensnaring melodies and body-moving grooves. He uses concise musical statements plucked with passion and precision primarily on his nylon string Spanish guitar although he also played classical, flamenco and electric guitars, keyboards and drum programming on the record. Rollins was accompanied by the same core ensemble that played on his three previous releases: Camardella (keyboards, piano), Grammy-winning violinist Charlie Bisharat, bassist Randy Tico, percussionist Dave Bryant and saxophonist/flutist Richard Hardy. Following a more direct path led Rollins back home creatively recalling his recordings from over a decade ago when he was a member of the hybrid world music duo Young & Rollins that favored flamenco, samba and rumba rhythms. In addition to the warm reception at radio, reviewers are finding favor with “Full Circle.” Below are snippets from some of the reviews.